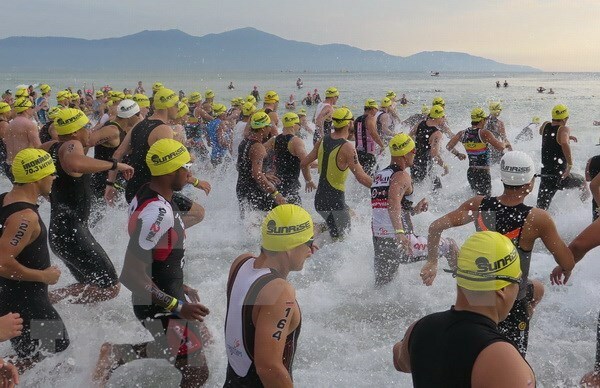 Da Nang (VNA) – Nearly 2,200 triathletes, including 40 professionals, from 50 countries and territories will be competing in the 5th Techcombank Ironman 70.3 Vietnam – Asia Pacific Championship on May 9 – 12. Athletes will race in individual and relay team events in the endurance event consisting of a 1.9km swim, 90km bike ride, and 21km run on the coastal track along My Khe beach, with total prize money of 75,000 USD up for grabs. There will be 50 qualifying slots available for top individual finishers in their age groups for the Ironman 70.3 World Championship in Nice, France on September 7 and 8. The organising board will host a 5km run to raise funds to help reduce infant mortality in Vietnam, and Iron Kids for children in age groups of 5 – 10 and 11 – 14. Newcomers and amateurs will race the Sunrise Sprint with a 750m swim, 20km bike ride, and 5km run. According to the event’s organising board, multi-time Ironman World Champions Patrick Lange and Craig Alexander in the men’s division and former Ironman 70.3 World Champion Holly Lawrence and defending Ironman 70.3 Vietnam champion Radka Kahlefeldt on the women’s side will race next month.